With the holidays just around the corner, I wanted to share one of my favorite (and easiest) ways to earn a little extra money. I am guessing many of you are up for earning a little extra cash as well, right? Join Ebates through my referral link to earn a $10 bonus! Sign up for a new account, spend $25 and receive a $10 bonus. Offer valid through 12/31/18. I do a fair amount of online shopping throughout the year, especially around the holidays. I always begin my online shopping by logging into my Ebates account. It only takes an extra minute and I am on my way to earning A Big Fat Cash Back payment. And I really appreciate getting paid to do something I am doing anyway. Registration if FREE! You only need to provide an email address to register and start earning money. No enrollment or participation fees. You pay the same price whether or not you use this service. Over 1700 participating stores. Chances are pretty good your favorite online (and some brick and mortar) stores are included. The average cash back is 2-10%, although with special promotions you can sometimes earn up to 25% cash back. You can increase your savings by using their special coupons. In most cases you can combine Ebates shopping with store sales, maximizing your savings even more. You will receive a Big Fat Payment 4 times a year. Payments are made by Paypal or check (your choice). Log in to your Ebates account. Haven’t registered yet? You can do so HERE. Select the store you will be shopping. I typically use the Search bar to quickly locate the store. Click on the “Start Shopping Now” button. This will generate a tracking ticket and redirects you to the store home page. You must do this each time you shop in order to receive your Ebate credit. It really only takes an extra minute and the rewards are well worth the small effort. Shop as you normally do and complete the check out process. I have also used Ebates with brick and mortar stores that offer In-Store Pickup (Lowes, WalMart, etc.). Just follow the shopping guidelines above and select “In-Store Pickup” for the delivery option. Not only do I earn a little extra money, my order is ready and waiting for me to pick-up at the store. Are you ready to start earning money to shop? 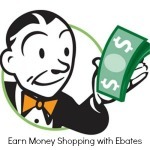 Register for Ebates and start saving now.